Some form of ancient and pervasive evil stalks the town of Derry in It, the new theatrical adaptation of the book of the same name from author Stephen King. Local kids disappear at a rate that would put Sunnydale to shame, but no one knows what causes it or how to stop it. Eventually, a group of kids have had enough and decide to investigate following the disappearance of one of their younger brothers. What they find is that this evil is embodied in the form of a clown that lures kids to their doom. Incidents involving this clown date back centuries. The kids will have to dig deep in their effort to put an end to this terror. The first poster will creep you out and contains some key iconography from the story. 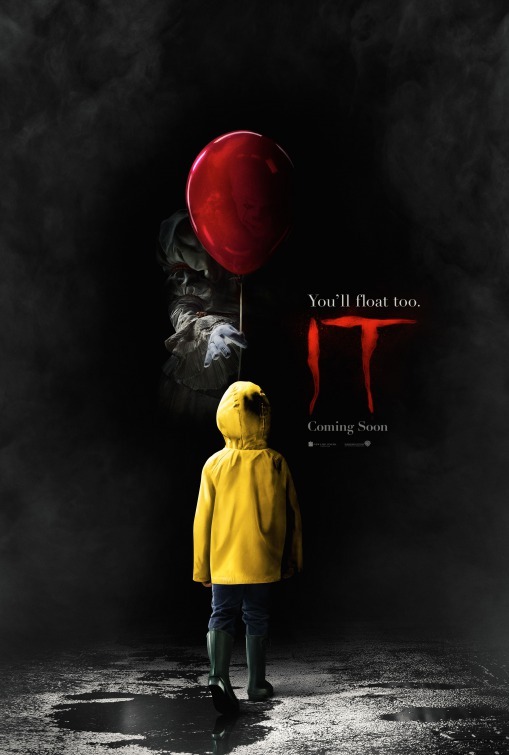 Pennywise reaches out from the foggy darkness as he hands a small child dressed in a yellow raincoat a big red balloon, the clown’s face seen only through the film of the balloon. 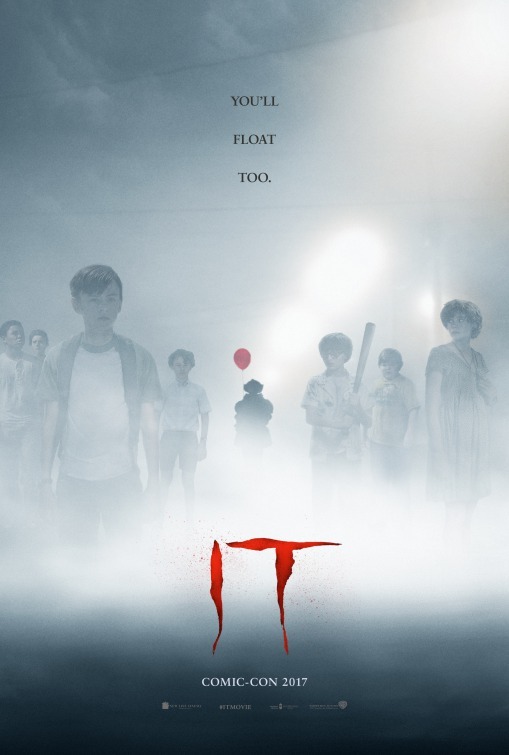 “You’ll float too” is the promise of the copy that’s just above the title. The whole negative space design here is meant to emphasize the terror of the characters that appear, making them a very small part of a bigger space and showing just how isolated they are. A special Comic-Con-exclusive poster shows the group of kids walking through the fog toward the camera. In the back at the center of the group is Pennywise, his balloon drifting above him. The first trailer starts with George sailing his homemade boat in the rain gutter before it goes down the sewer grate, which is where he meets Pennywise. After the credits, we hear that this is a dangerous town to live in, with a murder and disappearance rate that far exceeds norms. A group of friends meets to talk about the creepy clown they’ve all seen and theorize it lives in the sewers. It gets creepier from there as the danger starts to close in around them and George reappears to his brother. The full official trailer starts out with Bill explaining that everything does not revolve around you, a realization that is sometimes very harsh. Talk of how the monsters see individuals as weak but that groups can provide strength comes just before we meet Pennywise and hear about how some think the town is cursed by something evil. Bill sees the vision of his dead brother George and things start ramping up as he rails against how everyone in town just pretends like there’s nothing strange going on. 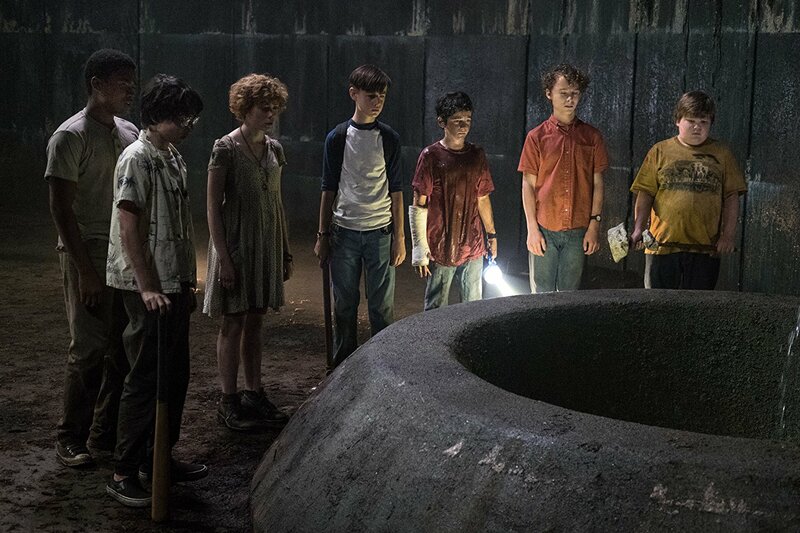 The kids fight back against Pennywise, hoping a group effort will mean fewer of them die. More creepy than I can handle. It shows just enough of Pennywise to freak audiences out but not so much that he overstays his welcome. The Tumblr-based official website opens by playing the full trailer before giving way to an image of Pennywise luring Georgie with a bright red balloon. On the front page is a big prompt to “Discover the VR Experience” and to get tickets. There are links to the movie’s Facebook, Twitter and Instagram profiles in the other corner. That VR experience, titled “It Floats,” allows you to jump into the world of the story and brings you face to face with Pennywise. Moving over to the left there’s a drop-down menu where the first option is “About” which gives you a brief story synopsis along with lots of information about producers and others involved in the movie’s making. After that is a “Gallery” with lots of shots of the kids but only a handful of Pennywise. Both trailers and a First Look spot are in the “Videos” section. There are no less than three links here related to tickets; one just for yourself, one for groups and one that takes you into a whole experience involving searching the sewers to find a theater near you. “Fan Art” contains a bunch of submissions that show just how creepy people can represent a clown, an effort that was tied to a contest. There’s another link here for the VR experience as well. Unexpectedly there are a bunch of games and other more entertainment-oriented activities for you to play on the site. “Enter the Sewer Game” has you controlling a paper boat down the sewer like you’re playing Enduro. “The Loser’s Club” is a slideshow that provides some backstory on the kids and their town. Finally “Escape Derry” is an interactive feature that has you scrolling deeper and deeper into the sewers to learn more about the story. TV spots like this one began running about a month out from the release that upped the tension and the danger. There wasn’t a whole lot that hadn’t already been seen in the trailers, but it works harder because of the condensed running time to pack in the jump cuts and scares. Online and social ads used the videos and key art, respectively. The trailers were also used for pre-roll spots on YouTube. The movie’s publicity campaign kicked off with a first look at Pennywise that didn’t add much detail but certainly made it clear a creepy clown would be involved. An even fuller – and creepier – look at the clown’s full costume followed a bit later. A clip debuted during the MTV Movie and TV Awards that starts off by showing the good times this group of friends is having. Things quickly turn ominous, though, as they explore a drainage tunnel and find the shoe of someone who went missing. Skarsgard was interviewed by his older brother Alex about the movie, his experiences as the creepy clown he plays and more. New Line gave it some promotion at San Diego Comic-Con, making it part of an overall horror-themed event and using that to show off some exclusive footage to hopefully get people talking. Two new images, including a creepy look at Pennywise, were released in EW’s fall movie preview issue. WB recreated the house that’s featured in the story as a haunted house that people in Los Angeles could visit. The movie’s common name caused some issues with the marketing since “it” isn’t exactly easy to search for. Still, that didn’t seem to be a problem, with the movie still scoring substantial awareness and engagement before release. Also on the business-oriented front was a story about how this fits into New Line’s overall support for horror films and nurturing of talent on that front. Skarsgard talked more here about how he got into the mind of the terrifying character he plays and how he didn’t want to be too mannered in his performance and risk comparisons with Heath Ledger’s depiction of The Joker. I kind of like that New Line decided to go for broke and not worry about keeping Pennywise concealed until the last possible minute. First looks at the character were among the first images released and he appeared early in the other marketing assets, a stark departure from the marketing of other movies where new takes on old characters are kept out of sight as long as possible. That’s enabled the campaign to fully utilize the clown’s terrifying image and persona, which has only increased the creepiness of the whole effort. What also stands out here is New Line’s commitment to experiential marketing, which makes sense given the tactile nature of the threat in the story. From Comic-Con events to the VR execution to the haunted house in L.A., the studio obviously felt immersing the audience in the story was a good way to get them excited for the movie. That’s paid off with decent tracking ahead of release, but we’ll see if people can get over the fear of clowns they already have (or the fact that they’re still traumatized from the 1990 TV miniseries version starring Tim Curry) to actually turn out to theaters.